I met with Richard and Charles Socarides Jr. wandering the Mercer Hotel in Soho, looking for a place to sit. Now a former lawyer and policy-maker, Richard, 62, was looking like a casual professional in a jacket and black jeans. 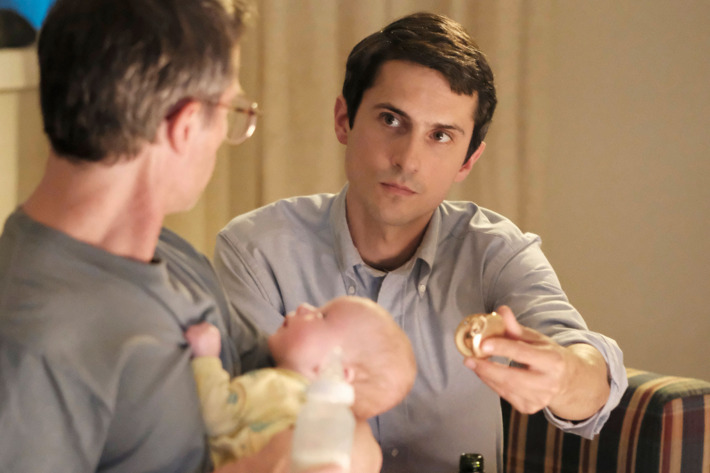 Charles, or Charlie as his brother called him, a 30-something actor living in Brooklyn (he demurred when I asked him his exact age), stars as a 40-something Richard (although he looks 28) working in the White House in When We Rise, Dustin Lance Black’s ABC mini-series about the gay-rights struggle. We were chatting before heading over to the offices of GLAAD for a screening of the fifth and six episodes of the series; episode six in particular portrays Richard’s life, and the irony of being a prominent gay man in the White House and the son of one of the most virulently anti-gay psychoanalysts. This was the first time they would sit down together to watch the episode of Charlie playing Richard onscreen. “More Nixonian,” Charlie broke in. 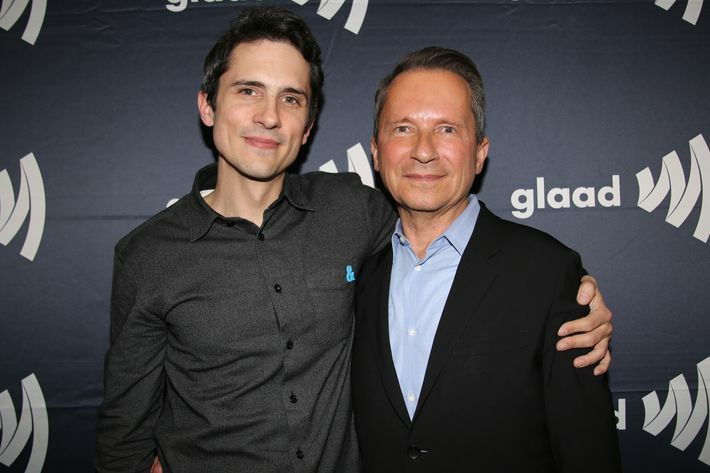 Charles Socarides Jr. (left) with his older brother, Richard Socarides. We made our way to GLAAD, where the brothers did a Facebook Live chat for the organization. It was an intimate gathering, including Black, who stationed himself at the bar for most of the night because he said he was too nervous to watch the series as it aired. Some of the other actors were there too, including Emily Skeggs, who plays activist Roma Guy, and Hedwig director John Cameron Mitchell. The two brothers settled into a couch in the back next to each other to watch the series. A friend of theirs, Keith, would break in and periodically exclaim, That’s amazing! during commercial breaks. When the scene was over, Richard leaned over to his brother and said, “That was on for a really long time!” They laughed, and after a moment, Charlie whispered into his ear, “You’re such a badass.” Richard smiled, nestled into Charlie’s arms, and they watched the rest of the episode.